Today at Computex 2017 Nvidia announced its Max-Q Design approach for laptops. 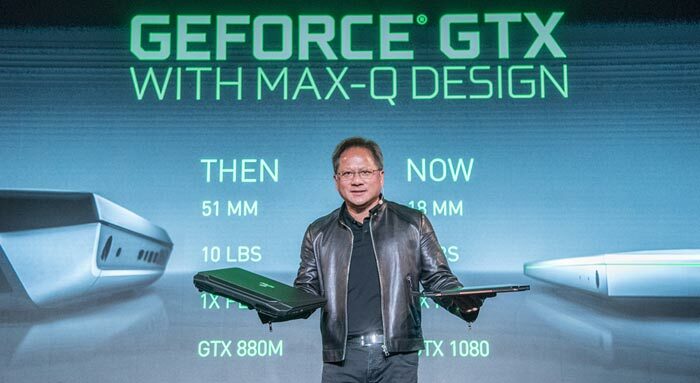 In a keynote speech Nvidia CEO Jensen Huang said that the new designs facilitate gaming laptops that offer "3x thinner with 3x more performance than previous generations". In practical terms this means that power of a GeForce GTX 1080 in a sub-18mm laptop weighing 5lbs (2.27Kg) or less. Additionally, Nvidia outlined its WhisperMode cool and quiet laptop operating mode. 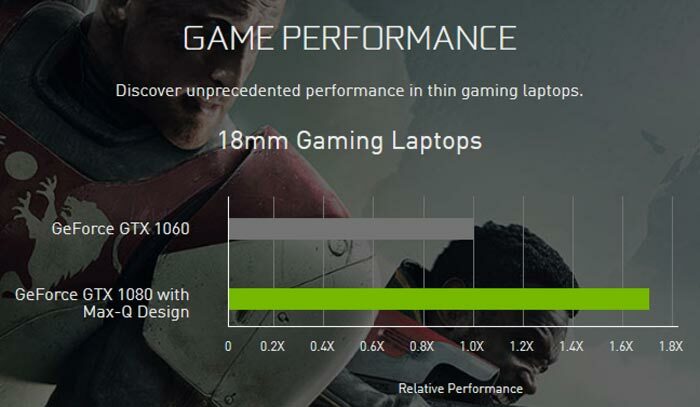 Thanks to Max-Q, "for the first time ever, all GeForce GTX GPUs are available in laptops as thin as 18mm". Unfortunately we don't get much in the way of a tech-talk about how Nvidia and its partners have managed this feat. Rather we hear how five years ago gaming laptops were like "a plate of nachos - hot, big and heavy". And since that time Nvidia has roughly doubled the efficiency of its GPUs in every architecture transition. Likewise WhisperMode is only briefly sketched out. This mode is said to be a new, ultra-efficient mode makes your plugged-in laptop run much quieter while gaming. It is said to work by "intelligently pacing the game's frame rate while simultaneously configuring the graphics settings for optimal power efficiency". It may well work in a similar way to Radeon Chill. Interestingly WhisperMode will be coming to all Pascal GPU-based laptops via a software update. Max-Q and WhisperMode build on the success of Nvidia technologies such as Optimus and BatteryBoost. 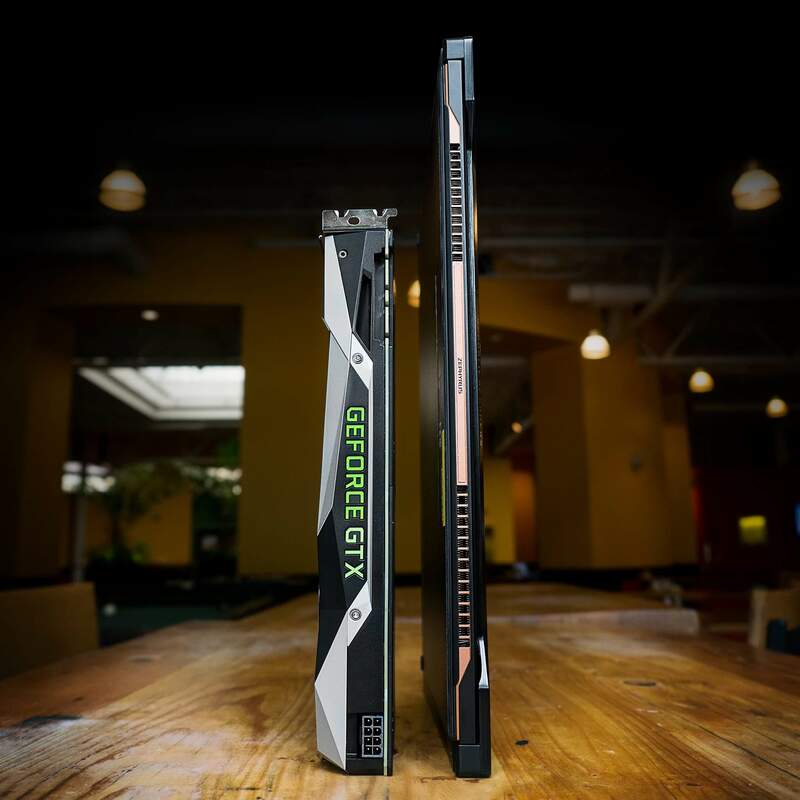 Thanks to all these technologies aligning - plus advances in GPUs, displays, memory, and SSDs - Nvidia believes that there has never been a better time to be a laptop gamer. That could be true, but I'm sure that the sleek Max-Q Design laptops aren't going to be targeting the accessible or mainstream end of the market, for these we should wish for great things from AMD's mobile APUs combining Ryzen and Vega. Max-Q designed gaming laptops equipped with GeForce GTX 1080, 1070 and 1060 GPUs will be available starting from 27th June. A 1080p high-FPS panel in a 15.whatever" format with G-Sync and a 1060 would not only be an awesome mini gaming machine but decently priced and have a good battery life. It feels like all laptops are just badly matched parts nowadays. It feels like all laptops are just badly matched parts nowadays. The whole gaming hardware market feels like a dinosaur. Normal computers are a quarter of the power consumption that they were, with all the benefits in noise, size and battery life that's brought. Gaming systems are still drawing over a hundred watts and in laptop form are hot, noisy and have laughable battery life. Max-Q, the point of maximum stress, seems like an appropriate name for this latest attempt to fit altogether too much power draw into a fashionable chassis. I agree, cooling seems to be the biggest problem right now. That and the price paid for the form factor.